A Great Place For Your Event. 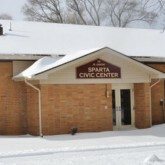 The Sparta Civic Center is a community building available for the public to rent. It is located adjacent to Rogers Park. • Seats up to 160 people. • New handicap accessible rest rooms. Please telephone Alan Hartman at 616-520-3681 for rental information.